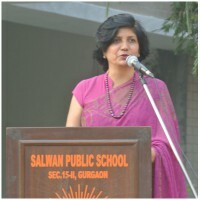 At Salwan Public School, Gurgaon, our mission is to create a warm, loving, secure environment that fosters creativity, curiosity, self-confidence and independence so that students may become models of peace and can succeed in an evolving world. We are committed to maintaining an environment that creates curiosity about learning, while engendering a love, respect and understanding of self and others. We believe in the real issue in education: to see that every child leaves the school well established in goodness, both outwardly and inwardly.We want children to do more than just learn. We want them to think. And then to take that understanding to change the world. And we believe that this begins here-at our beloved School. Although there are no words to describe our thankfulness for the pleasure of sharing your children with us, we can say thank you for your trust and encouragement- it is an infusion of spirit. I invite all of our parents to partner with our students, their teachers and administrators in helping to pave the path to what I believe are the endless new horizons of greater student achievement. I personally look forward to seeing all of you at our school throughout the year, we must be an active community together. Thank you and happy days.